* This article was contributed to Google Maps Mania on August 27, 2005. Hi, this is nagoyan the earthhopper again, from Japan. We have recently got relatively large earthquakes near big cities - Tokyo and Sendai, and even big Typhoon #11 just hit the area around Tokyo (it's called Mawar, but we don't usually call them with human name). People are well prepared for fatal disaster like epicentral earthquake, but they are trying to be best in various ways - one of current best-selling book is the customized handy maps that instructs how to walk back home from central Tokyo just in case of disaster situation while many of lifelines are not available. This maps cover most of directions from major business districts where 4+ million people commutes from outside of Tokyo mostly by trains and subways, with good instructions where to get medical relief or food/water, and designated emergency evacuation areas, even where to avoid. I hope they could issue English one for sure. So here we go for today's edition of Japan View. In earthquake disaster situation, just like one in Niigata last year, it's going to be difficult to get connected as mobile phone network might be congested or internet routers damaged. Posital provides "where you are" functionality using Google, Yahoo and Mapfan maps, and the location info is shared only for the people you permitted. And using a screen saver application on GPS mobile phone by au, you can automatically update it, even keep informed about your friends. Poital even provides social network community, fully supported by geotagging. You can predefine your various human relationships (like family, lover, close friend, friend, acquaintance and anonymous) and what info to open to whom, then communicate in very organized way. Also you can geotag to any of info you have created - bookmark, RSS feed of blog entry, news, merchandise at Amazon, BBS thread etc, and syndicated with other social network like mixi (just like Wallop by Microsoft Research). tabelog.com is a new restaurant guide service of kakaku.com, a very large price comparison service company. This guide is looks like sfsurvey.com, as you can narrow the search on the map and each reviewer posts impressions and place them on his or her own map. The uniqueness of this guide is that it employed professionals like food writers as well as ordinary food fans to reinforce their contents than others. Also, each of registrant will have their own page, map and favorite reviewers. kakaku.com released another Google Maps mashups for world heritage travel guide and hotel reservations to leverage their services to compete with others. Chieko Asazuma, a pro food writer reviews lots of restaurant in Tokyo. You can browse her reviews on her own map. It is always good to revisit the history with the map in your hand for most of fans, including myself, and the Japanese castles always symbolize great stories. Eric Obershaw, one of those fanatic, created comprehensive database of 50+ castles, mostly his personally visited, with a cool Google Maps mashup. This includes most of my favorites, like Gifu Castle (my flickr photo), which was built by my hero, Oda Nobunaga, or Aizu Wakamatsu (a.k.a Tsurugajo - f) and Himeji (f). Hopely he can add my another favorites, Kanazawa and Kumamoto, but this is great work for us. 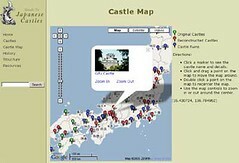 Google Maps Mania : Japan View - Sep. 8,..
Google Maps Mania : Japan View - Sep 2, ..
Google Maps Mania : Japan View - Aug 18,..
Google Maps Mania : the Japan View (8/9/.. If you have some pictures of Kanazawa or Kumamoto Castles you'd like to see added to the site, I'll happily do a writeup and give you credit and a link back to your site.